Hey guys. There won’t be a recap of last night’s Reign of Winter session today, because I had to call it off at the last-minute. My friend Edwin made a valiant effort at stopping a goal in hockey yesterday, but got a high-speed booted kick in the jaw for his trouble (not intentional, the guy was just running hard as he could, and ran straight through Eddie, taking a tumble himself in the process), and his wife is currently out-of-town. So I called Jimbles, let him know what had happened, picked up some Goodberry’s frozen custard and rolled around with a bag of DVDs to keep him company and make sure he was okay. I think the rest of the group understands, when a friend is hurt and needs you, they take priority. He would have done the same for me if the roles had been reversed… Hell, over the years he’s done things like this for me countless times. The strangest thing about the whole situation though was the song I was listening to when I got his call… I’d been listening to various OSTs all day for inspiration while writing, and decided to swap over to Chevelle’s latest album, La Gárgola. Track 4 had just got through the intro when I got the call. The name of the track? Jawbreaker. Ah Synchronicity, your sense of humour is as gloriously dark as ever. Anyway, he’s fine now, though still very sore. And I promised an update today, so even though I don’t have a session to recap (and won’t until June, at least not for Pathfinder, as the group have other commitments until then), I had to come up with something for you. Which is when I realised that this is the perfect opportunity to stop thinking about reviews, and actually write some. I’m going to start with something a bit easier to review than source books though, since that involves having to weigh up concepts of game balance, playability and so on. 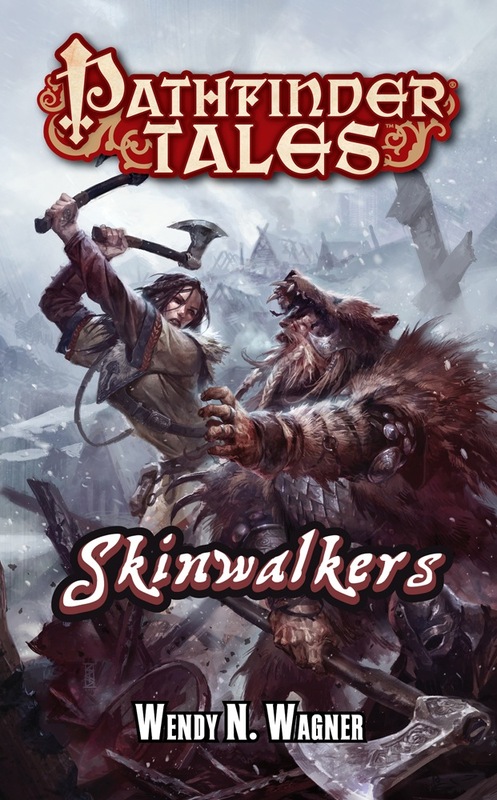 So my first review is going to be for one of the more recent Pathfinder Tales novels, Skinwalkers. Pathfinder Tales are the official novels set within Golarion, the canon setting of the game. They’re like Wizards of the Coasts Forgotten Realm novels, designed to tell stories set in the world of the game, and in the process flesh out details about it. In more recent stories as well, Paizo has been tying some of the Tales novels back into the current or upcoming Adventure Paths. For example, King of Chaos actually ties directly into the Wrath of the Righteous Adventure Path, with the artifact the heroes are searching for being of vital importance in the AP; and the upcoming novel Reign of Stars (a sequel to the earlier City of the Fallen Sky) is confirmed as tying into the next AP to be published, Iron Gods (and on that note, you have no idea how excited I am for Iron Gods… BRING ON THE SCI-FANTASY!). One thing I found with the D&D novels was that they almost never managed to pull me in to the story, to make me feel invested in it. The Ravenloft novels, and some of the Dragonlance ones (the original trilogy, the Legends stories and the War of Souls trilogy are the ones that spring to mind) are the only real exceptions to this. Not really sure why that was the case, but it was. Anyway, that’s never been a problem for me with the Pathfinder Tales novels. Each one I’ve read has been enjoyable from start to finish, and although they’re not exactly masterpieces of literature, they’re not meant to be. They’re just well written, exciting fantasy romps in a setting which is basically a fantasy kitchen sink, and that’s perfectly fine by me. So, with that said, let’s get this started. I’ll try to avoid spoilers as much as possible, but there may be minor ones given that I kind of need to talk about the book to review it. From author Wendy N. Wagner comes a new adventure of vikings, lycanthropes, and the ties of motherhood, set in the award-winning world of the Pathfinder Roleplaying Game. Skinwalkers is Wendy N. Wagner’s first full length novel. She’s done Pathfinder Tales work before, but it was part of the short fiction that Paizo publish on the blog, usually as prequel stories to some of their novels (both Winter’s Wolves and Mother Bear are related to Skinwalkers, and can be found here). Her bibliography shows numerous other short stories, poetry and non-fiction that she’s worked on. For a first full novel, I’m seriously impressed. It’s not my favourite of the Pathfinder Tales, but it’s exciting, fun, and extremely well written. I also enjoyed that the story was set in the Ironbound Archipelago, as it’s part of the Land of the Linnorm Kings, an area that I find particularly interesting in the setting, since it is essentially the land of vikings. The protagonist, Jendara Eriksdottir, is a former pirate who gave up her life of crime and became a trader after the death of her husband, so that she could raise her son in peace on the islands where she was born. She doesn’t like who she once was, and is determined to make up for her misdeeds by helping her community and raising her son as best she can with the help of his uncle and the other families in the village. During a stop on a regular trading trip, she comes across a scene of carnage at a quarry that reminds her of a scene from long ago in her past… The novel deals with Jendara’s struggle to defend her people and home against raiders who threaten everything she loves. I think one of the biggest strengths of this novel is the characters. Credit where credit is due, Ms. Wagner knows how to write some believable characters. Jendara in particular felt real to me. Her desire to change who she was, the demons of her past (both due to her life as a pirate, and other events in her life); the disgust she feels when she starts to revel in violence again; the protectiveness she feels for her son; her strength in the face of adversity, even when she sometimes feels doubt; and her rejection of the traditional worship of ancestor spirits and clan totem animals… it all comes together to paint a vivid portrait of her in my mind. We’re introduced to her while she is out on a hunt, and the scene immediately starts to give a feel for her character, interspersing the dialogue and descriptions with flashbacks of a traumatic event. It’s a very effective introduction, and made me want to know more about her immediately. Just as an aside, I was quite amused when I opened up my copy of Inner Sea Combat at lunch today and found Jendara listed in the second on notable martial characters of the Inner Sea region. For those that are interested, she’s apparently a level 6 Fighter, which based on her prowess in the novel sounds about right. I really like that they’ve tied her into the canon that way. Other characters, like her husband’s brother Vorrin, her son Kran, and the crew of her ship, while not as strongly developed, still give that same sense of being real, tangible characters you can relate to. Kran, as the eleven year old boy who desperately wants to prove his worth and show that he can be trusted to join the hunting parties, really struck a chord with me. Even the minor characters, like the unhelpful steward of White Estrid (one of the Linnorm Kings), or the librarian of the Basalt Library, have their own motivations and feel like more than just bit pieces. Something I’ve noticed a couple of people complaining about in reviews of this novel is the increased level of violence, and the lower than normal use of magic. Pathfinder Tales have, in general, been fairly high magic and haven’t had particularly graphic descriptions of violence in them, and some people didn’t seem to appreciate this shift in tone, which is fair enough. Different strokes for different folks and all that. That said, I’d argue the idea that it doesn’t feel like a Pathfinder story. While magic may be common for Pathfinder gaming groups, with most groups having at least one caster, that doesn’t mean it’s going to be absolutely everywhere in the world. I find it perfectly believable to see that there’s a number of islands where there aren’t any clerics, wizards or sorcerers (I’m assuming that the wise women, with their herb lore and healing ability, aren’t actually clerics, as they seem to have much more restricted powers). That’s also not to say that there isn’t any magic in the novel. Certainly it starts to pop up more and more after the halfway point of the story, just not in a flashy “fireballs and lightning” kind of way. I think the increased focus on the description of the physical combat and it’s aftermath actually worked very well for this story, since it focuses entirely on characters who are non-magical and have to rely on their wits, skill and strength at arms to get them through. I don’t feel it’s too graphic, especially not compared to some low-magic fantasy I’ve read. There’s the occasional scene where Jendara may go overboard, but it’s usually prompted by fear for the lives of her friends and family; other than that the worst of it is the descriptions of the state some of the bodies that are found are in. I’ll put it this way, it’s definitely no Game of Thrones. The biggest weakness in the story for me? The twist midway through the plot. Not that it’s not well written, and it works in the context of the story, tying everything back together and making sense of a number of plot elements. The problem was that I saw it coming from very early on, around the time of the quarry scene. Now whether this is because it is an obvious twist, or because I just spend too much of my time on TV Tropes and have started to pick up on these sort of things faster, I couldn’t say. But rather than a moment of “Oh my god” shock, I got a moment of “hah, called it” satisfaction. Not a bad thing, just an observation. In terms of writing style, I found the book to be clearly written, easy to understand, and engrossing. There are a couple of little oddities here and there, but overall it’s a slick read. Wendy N. Wagner has a good grasp of how to describe combat to keep it interesting, and does well with the interactions between the various characters as well. I read it in an evening, but given that I’ve been known to read up to two books a day on the weekends, don’t let that make you think it’s too short. The story is the perfect length. Long enough to get everything it needs to done, but not so long that it starts to drag. So, would I recommend Skinwalkers? Long answer: Yes, so long as you don’t have a problem reading a fantasy novel that doesn’t contain huge amounts of magic (no healing potions here! ), does contain (somewhat) graphic violence. It’s not meant to be anything more than an exciting romp through the world of the Pathfinder RPG, and at that, it succeeds admirably. I actually hope we get to see some more work from Wendy N. Wagner soon, either continuing Jendara’s story or with something brand new. Alright everyone, that’s it from me for now. I’ll be back in a couple of days with a review of the latest Tales novel, The Redemption Engine, by James L. Sutter. Til then, take it easy, and keep the dice rolling. This entry was posted in Fiction, Reviews and Playtests and tagged Barbarians, Fantasy, Fiction, Golarion, Paizo, Pathfinder, Pathfinder Tales, Skinwalkers, Vikings, Wendy N. Wagner. Bookmark the permalink. Skinwalkers is an EPIC PATHFINDER TALES novel and Jendara has quickly become one of my favorite Pathfinder heroes! Great Job Wendy N. Wagner! !